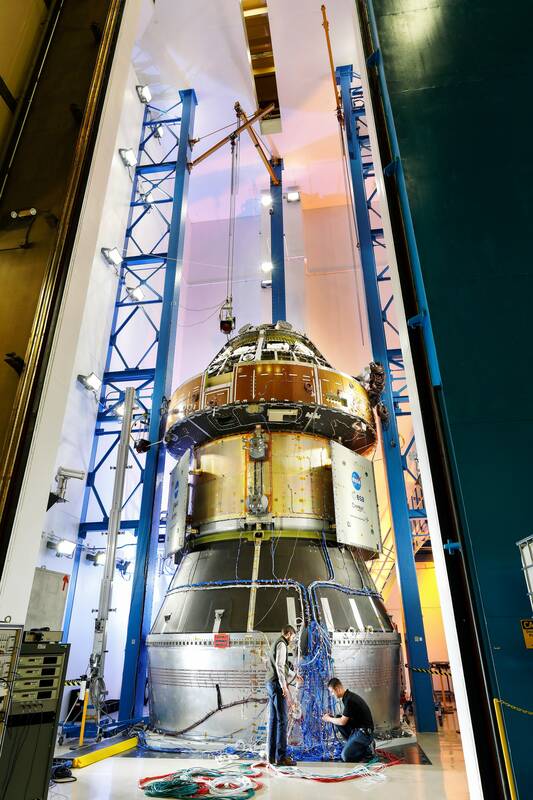 NASA’s Orion structural test article (STA), in its “full stack” launch configuration, was lifted into a reverberance acoustic chamber at Lockheed Martin Space. INSIDE AN 80-FOOT-TALL chamber on Lockheed Martin’s Denver-area campus, backgrounded by red-rock ridges, stands a hulking spacecraft. You have to crane your neck to see the top of the apparatus. At the bottom, wires spew from a porthole to snake up and down and away. The cylindrical structure flows into a duller, funnel-like cone, which tapers into a tower with rocket nozzles. Next to it, the blue scaffolds of an indoor crane resemble a launchpad gantry. But this spacecraft isn’t going anywhere. It’s a copy of Orion, the NASA vehicle that will someday ferry crew and cargo beyond Earth’s orbit—to the moon, to Mars, to deep space. This Orion twin, which we shall call PseudOrion, is architecturally identical to the real thing, which is nearly 2,000 miles away in Florida. It’s a lot safer there. Because here in Denver, teams of engineers are putting its doppelganger through hell, to probe its limits and ensure it won’t crack under pressure. Its sacrifice means Real Orion won’t have to endure that same strife and the potential ensuing damage. On Tuesday, the team—some of whom used to be NASA space shuttle techs and have shuttle tattoos commemorating the 1981-2011 flights—were submitting PseudOrion to a series of vibrational tests, meant to reveal its resonant frequencies. Every object has its own natural frequency, and when you vibrate it at a frequency that closely matches its natural one—putting them, in a literal sense, in tune—it vibrates. Hard. These engineers want to know when that will happen and what it will look like. Finding out apparently sounds like superpowered air conditioning, or a minor second chord played as a quiet, discomfiting soundtrack. But PseudOrion doesn’t seem to be shaking, or to be being shook: It looks calm and still and immovable. Vibrational, or modal, testing is just one of five tortures that this beast will have to endure. It’s expensive to build two versions of the same thing, especially when you’re just going to brutalize one. But if you value time, this is an economical option. “If we were going to run all the tests we need to run, it would tie up the flight article for around two years,” says Dan Qvale, head of the copy’s assembly and test, talking over the noise. With this twin, he explains, the team can run tests in parallel with Orion’s development (which has experienced cost overruns and delays, like, you know, all spacecraft). And they can treat the twin worse, subjecting it to conditions that the real thing should never encounter—just in case it does. To pass, the test twin simply has to survive. So, for example, if they put 1.5 times the rated pressure on the crew capsule, and it doesn’t snap, A+. “‘Survive’ means ‘doesn’t rupture,’” Qvale says. In addition to pressure tests, the engineers here will check to see how it holds up to lightning. “If you couldn’t roll onto the launchpad till you knew there would be no lightning for two weeks, in Florida,” says Qvale, “you’d never do it.” They also see how it stands up to other kinds of shocks, like when explosive bolts shear off to deploy the solar array. And then there are the acoustic tests, mimicking the music of the rocket itself. Above PseudOrion, Tuesday, are a few horns. During an acoustic endurance event, engineers shut the 18-ish-inch-thick door, filled with sound-absorbing sand, that rolls closed in front of the spacecraft. The team then pumps nitrogen gas into the horns, which assault the article with 150 decibels. Although that involves frequencies, it’s not the same as Tuesday’s test. That day, a crane hefts a giant shaker motor—which does what it sounds like—up to PseudOrion. Engineers press the motor flush against its fuselage, while the crane holds it in place. And then they turn the motor on. It starts to shake, fast. The motor runs through a range of frequencies, and accelerometers attached to the body measure its response. The team will test the spacecraft as a whole and specific parts—in this case, the panels surrounding the crew capsule. During Tuesday’s test, the frequencies are so high that PseudOrion looks eerily still, the only evidence of its assault that hum in the conditioned air. As Qvale finishes explaining his test, the sound stops. The motor stills. The silence seems wrong: A room this big shouldn’t be this quiet. Soon, though, a tech starts driving a cherrypicker toward PseudOrion, preparing to replace this motor with a more powerful one that produces a lower frequency. More shakes: just to be sure. Where Real Orion will (eventually) go, and when, has shiftedwith the political and financial winds. Mars first? Moon first? 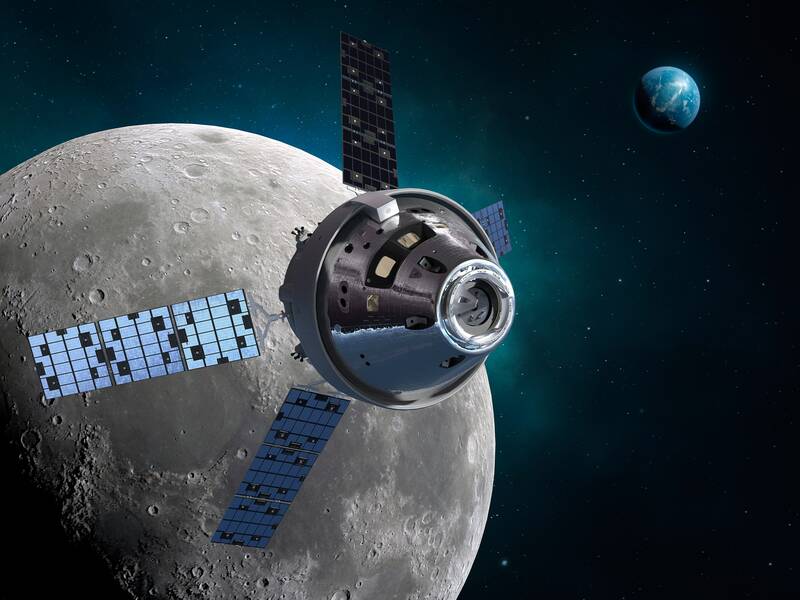 To the permanent lunar-orbit settlement NASA has planned? “Through those changes, we haven’t had to tear that thing apart,” says flight director Paul Anderson, when he stops by the test building. Anderson is in charge of Orion’s second mission—its first with people—which will likely take place in 2023. Despite the changes in its future mission plans, the structure of the craft hasn’t changed, because Orion was always supposed to be a multi-destination vehicle. When all these tests and the first two experimental missions are all over, NASA may begin producing, launching, and perhaps refurbishing multiple Orions for regular flights to deep space—wherever in particular that happens to mean at whatever particular time it happens.